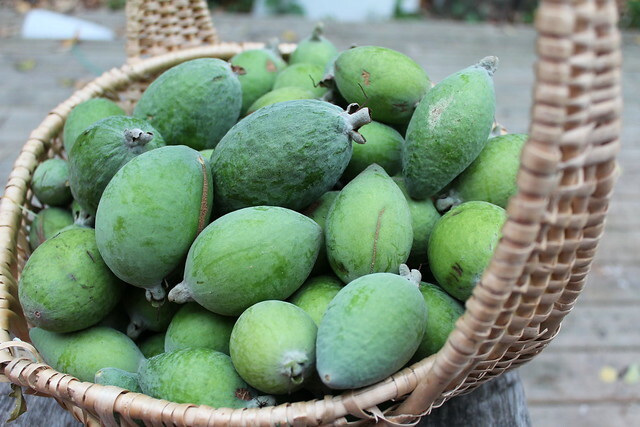 Feijoa fruiting season is eagerly anticipated by most people in the New Zealand and many backyards have a tree or three that drop the green fruit in a thick carpet from the trunk to the drip line. Feijoas drop when they are ripe although they can be picked to help prevent bruising. 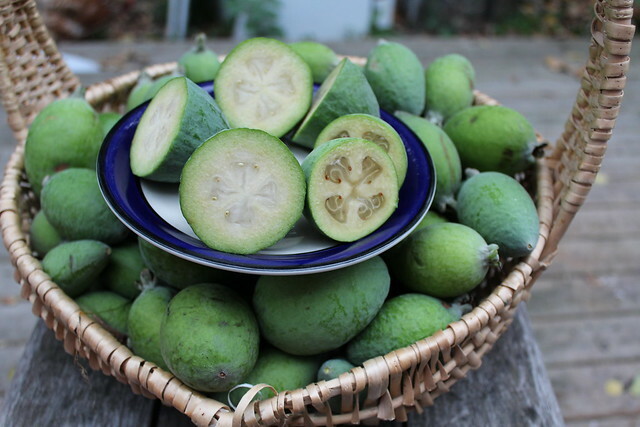 Feijoas are also known as pineapple guava and guavasteen – they are native to several countries in South America but grow extremely well here in the North Island of New Zealand. Our feijoa tree had an unprofessional haircut (I cut off a bit here, a bit there and trimmed the branches from the ground to give some clearance in order to collect all the fruits without looking like I barely survived a fight with the cat) a few years back. The prune was successful despite me not really knowing what I was doing as this year it has produced lots of lovely large fruit. For the feijoa pulp, half the smaller fruits and scoop out the flesh with a teaspoon. You could peel them but they are a bit fiddly and get slippery. The larger fruits are easier to peel – use these for grilling, roasting or preserving. 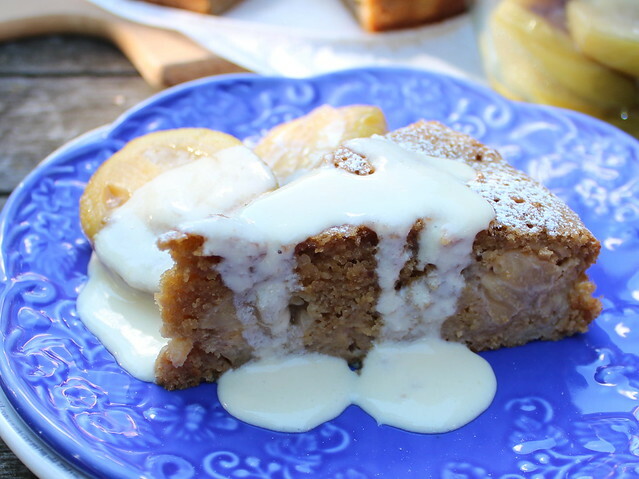 Feijoas are a perfect replacement in a lot of baking and dessert recipes for apples so dig out your best apple recipes and try making a feijoa version. If you haven’t tried feijoas or can’t get them, try this recipe with apple or pear. The ginger can be substituted for cardamom. 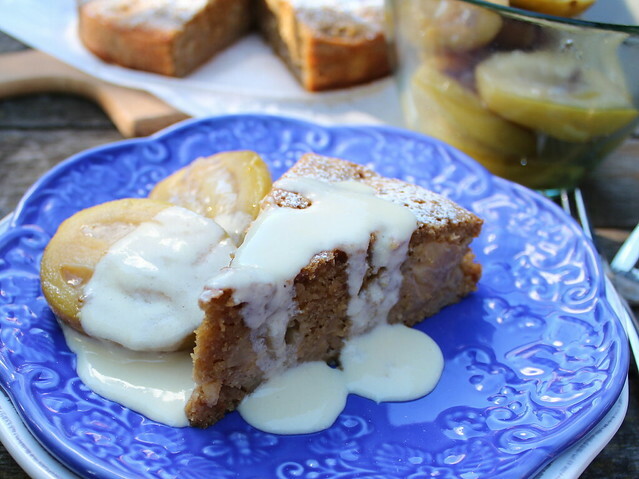 I am fairly sure this cake would also be nice with persimmon but I haven’t tried it (yet). 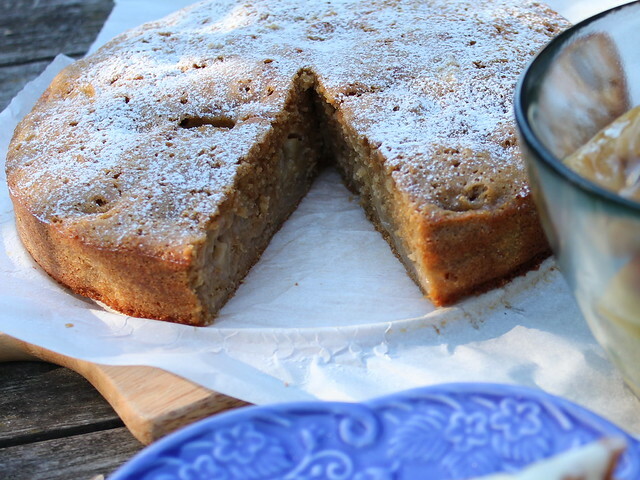 The cake is a moist cake and is best eaten within a couple days of baking. I find that in our house the cake barely lasts a day before the cake tin holds just a few crumbs. It is lovely with the grilled feijoas (these are really good with muesli & thick Greek yoghurt for breakfast). Or serve with hot custard and vanilla ice-cream. Preheat oven to 180°C. Grease & line a 22 cm round spring-form tin. Sift the flour, baking powder, ginger and salt into the egg mixture. Add the melted butter and feijoa pulp and gently stir until all ingredients are combined. Bake for 40–45 minutes or until golden and a cake tester inserted in the middle of the cake comes out clean. Cool in the tin for 15 minutes then remove tin and transfer cake to a wire rack to cool. To serve: dust the warm cake with icing sugar. Slice and serve with warm grilled feijoas and a drizzle of the sauce. Serves 8. Place the oven rack on the second from top setting. Preheat oven to 200ºC and set to grill function (top element only). Peel the feijoas and cut off the blossom end. Place in an oven proof dish, cut side up. Sprinkle sugar over the feijoas and place in the oven. Turn after 8 minutes, then cook for a further 7-8 minutes or until the feijoas are soft and cooked through but not pulpy. Remove from oven and allow to cool. Combine the yoghurt, syrup & icing sugar in a bowl and whisk until smooth. Transfer to a pouring jug. Note: if your yoghurt is quite thin, place the yoghurt in a sieve with a bowl beneath to catch the whey. Allow the yoghurt to drain for several hours or until thick enough. Once the syrup is added, the yoghurt sauce should have a pouring consistency similar to cream. Note: I use Shott Passionfruit Syrup which is a New Zealand made real fruit syrup concentrate that has no seeds. Tasti Passionfruit in Sweetened Syrup would also work – with the option of sieving out the seeds or leaving them. If you have access to fresh passionfruit, use them instead and adjust the icing sugar until the sauce is sweet enough to taste. Note 2: Feijoa make a great fruit snack – there are quite a few different varieties with the newer ones being larger fruit with a sweeter taste and less gritty flesh. My preference is for the older style – they are more tart with lemony undertones. We have one old tree and six new trees which should keep us supplied with feijoas from March through to June. Of the feijoas in the photo – the fruit with the paler flesh is the older style fruit while the clearer flesh (more caramel coloured) is a newer style fruit as far as I am aware (I’d have to check my orchard plan to figure out the variety of the newer tree). 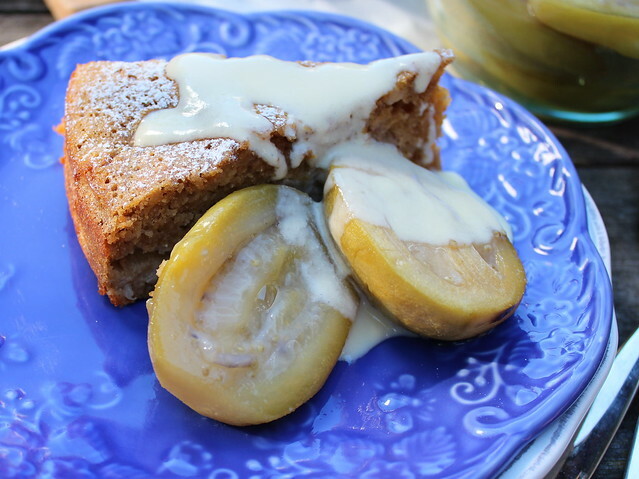 This entry was posted in Autumn, Baking, Cake and tagged cake, Feijoa Cake, Feijoas, Grilled Feijoas, Passionfruit Syrup, Wholemeal Cake, Wholemeal Feijoa & Ginger Cake, Wholemeal Feijoa Cake, Wholewheat Feijoa Cake by Jo Dohrman. Bookmark the permalink.